The Caspersen Rowing Center came alive on Wednesday afternoon with some friendly, intra-boathouse competition among the different high school crews that train here. 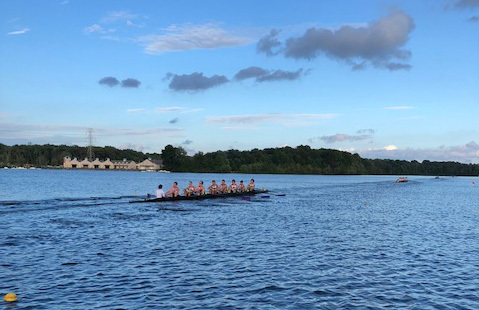 The Lawrenceville School, Hun School, Peddie School and Mercer Junior Rowing all took part in two co-ed events, each a 4.6K ‘round the lake’ timed race in two boat classes. The first group to go off was the 4+ (coxed 4s), 4X (quads), and event. Next the teams seated 8s for the same trip. The weather cooperated and the Mercer Lake Challenge gave the crews a chance to test their speed as the Fall Head racing season gets underway. Next up on Mercer Lake will be the Small Boat Challenge on October 6th & 7th , 2018. The Mercer Juniors and Mercer Masters will compete at the Head of the Housatonic in Derby CT on October 6,, 2018.